I know that is also your noble goal, and that means people who are in our presence will need to be able to see in our words and deeds the same fruit of the spirit that Jesus himself constantly manifested. OK, we each have the gift of holy spirit, the divine nature, the “incorruptible seed” planted in us, so such fruit is possible. But it does not grow automatically. We need to apply “fertilizer,” if you will, by putting a lot of God’s Word into our minds. We must “water” the plant that grows by becoming sensitive to the spirit of God within us. We must also allow plenty of “Sonlight” to reach us. That is, we must do our best to stay “face to face” with our Lord Jesus, allowing him to show us both the “weeds” that he will then help us pull up from the root, and the useless things within us that need to be pruned. What that really means is that moment-by-moment we allow Jesus to be our Savior from “the sin that dwells within us” (Rom. 7:17). I think what we are talking about here is “truth in the inner parts,” that is, our internalizing the Word of God to the end that it comes out in what we say and how we act. Take a look at the following verses written by David shortly after his sin with Bathsheba. Today in the USA we live in a “postmodern” culture, where the prevailing opinion is that there is no such thing as “truth.” Once upon a time, in what we can call a “pre-modern” worldview, historical facts, the laws of nature, logical ideas, divine revelation, and moral principles were considered issues of truth. Most people were open to outside reality, that is, what the “physical universe” was telling them. In the 18th century, however, this worldview began to be eroded by “modernism,” the belief that the only truths were those that could be tested by scientific rationalism. It is important to note that modernists still believed that there was such a thing as “truth,” but only the guys in the white lab coats could find it. Perhaps you remember some of them in the television tire commercial of some years back. You know, the guys in white lab coats who stood in the back of a moving truck and threw out things like nails, bottles, chain saws, stoves, etc., so that the car following them, riding on Acme tires or whatever, could prove the strength of the tires by running over the stuff. Those guys were real scientists! Today, “postmodernists” believe that there are no absolutes (which is, of course, an absolute!). Rather, they say, truth is “relative.” And let me tell you that you gotta watch it when your relativists call up and ask if they can come over, because they’re liable to stay forever and eat you out of house and home. 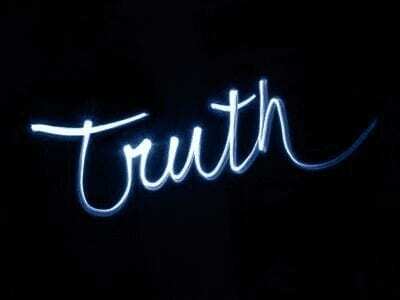 For many people today in our postmodern world, “truth” is constructed by each individual for himself. I guess they didn’t notice Proverbs 28:26: “He who trusts in himself is a fool, but he who walks in wisdom is kept safe.” Of course, true wisdom comes only from God, primarily via His written Word. But postmodernists create their own “reality.” Each person has his own truth. I’m sure glad that’s not me, aren’t you? Arr-rg-gh-h! I just did it! I made up the “reality” that I never make up my own reality! And each of us has exactly that tendency written into the code of our sin nature. Absolutely. Why, if I had a nickel for every time I’ve made up my own “reality,” I’d be writing this column from Tahiti. Want an example of made-up reality? OK: “Everyone I know is telling me that I’m arrogant. What is their problem?” Hey, unless your name is “Tonto,” I ain’t the Lone Ranger. Obviously, postmodernism is yet another in the long line of assaults on the integrity and accuracy of the Word of God, a line that began in the Garden as recorded in Genesis 3:1ff. Get this: In the postmodern dismissal of truth, the meaning of words is not fixed, but rather is up to one’s own interpretation. Thus it is not necessarily the author of a statement who determines its meaning, but the hearer. On the contrary, the phrase “the truth” appears more than 80 times in Scripture. The word “the” means that there is only one source of truth—God’s Word. It also means that there is only one right meaning of each verse in God’s Word, and it is the Author, not the reader, who determines that meaning. God knows what He means, and it is up to each person to use the keys that God gives him to arrive at the correct understanding of His words and then apply it in his life. The good news is that this is possible, because God designed people to believe His Word, and He designed His Word for people to believe it! I assert that there are three categories of truth, so to speak, which I’d like to call “capital ‘T’ truth,” “capital ‘T’ truth in me,” and “small ‘t’ truth.” “Capital ‘T’ truth is the written Word of God. Period. It’s like “God said it; that settles it.” 2 Corinthians 13:8 is an interesting verse that applies to this idea: “For we cannot do anything against the truth, but only for the truth.” I take the first half of that verse to mean that God’s Word is truth no matter how we relate to it. But what is it that we can “do for the truth”? We can be true to it. That is, we can believe it, and to really believe it means that we live it. We put on the truth in our “inner parts” and act on it. As the saying goes, “Thoughts are the seeds of our words and deeds.” It’s like “God said it; I believe it; that settles it for me.” That is what I call “capital ‘T’ truth in me. The third category is “small ‘t’ truth. What I mean by that is being true to that which is “truth” for you. It is standing in your convictions until you are convinced otherwise. It is being (i.e., reality) authentic about how you perceive things, especially in your relationships with other people. Too many times I have been afraid to say what was actually so for me because of what I thought others would think of me. The problem is that when I fail to be “h-ONE-st,” I negate the possibility of genuine “uni(ONE)-ty.” It is only when I am authentic about reality as I perceive it that others can know exactly where I am coming from and then point out to me if I need to shift to get in touch with reality as it really is. Think about it. Look back up at Psalm 51:5 and 6. Verse 5 talks about what we now know from Romans to be the sin nature that each of us inherited from the First Adam. Verse 6 tells us what we can do about it. For us Christians, our holy spirit power source makes possible spiritual metamorphosis when we hide God’s truth in “the inner parts” of our hearts. Romans 7:14-25 shows us the battle raging within each Christian between the old nature and the new nature—and how to win it. Those classic verses hold the keys to differentiating between what we can call “the real you” (the “inner man,” that part of your mind you have renewed to “mind” the spirit) and “the false self” (the sin nature that dwells in you). Verses 20 repeats what verse 17 says in order to emphasize it. When we do what the renewed mind part of us does not want to do, or when we do not do what it does want to do, it is because of sin that dwells within us. Can we use that verse to avoid accountability? [“OK, I stole your car at fellowship last night, but it’s not my fault. Talk to my sin nature about it.”] No. But we must recognize that it is “the law of sin and death” at work within us that is the cause. The choice is ours as to whether we go along with the sinful tendencies within us or whether we refuse them in favor of following (Rom. 8:2) “…the law of the Spirit of life…” in Christ Jesus. The war raging on the battlefield of each Christian’s mind will go on throughout his life, and God wants us to use His strategies to win it. We must also be aware of our Enemy’s strategies, both internal and external. Satan’s goal is to arrange the circumstances around us so as to “push our buttons,” that is, to get us to respond to external stimuli according to the dictates of our sin nature. But we have the power to “just say no” to his methods, and “just say yes” to the godly desires generated by that part of our conscience that is educated to the Word. The last two verses of Romans 7 sum up the previous ten and are critical to victorious Christian living. (25) Thanks be to God—through Jesus Christ our Lord! So then, I myself in my mind am a slave to God’s law, but in the sinful nature a slave to the law of sin. Let’s dissect those verses a bit. In verse 24, the phrase, “this body of death” is a synonym for the sin nature. Now if verse 24 concluded the Bible, we’d be canoeing capriciously (Hey, I didn’t want to use the cliché). Do I have to explain it? “Up the creek without a paddle.” But that’s not the end of the Bible. Verse 25 trumpets the answer to man’s basic spiritual problem, which is SIN. The only solution to that problem is a person—the SAVIOR from sin, Jesus Christ. Then comes the last sentence, which neatly ties up the whole section. In the first part of the sentence (“So then, I myself in my mind am a slave to God’s law…), the words “I myself” refer to the “inner being” (v. 22), the renewed mind part of each of us, that part that wants to do God’s will. Our goal must be to keep taking more and more ground between our ears, that is, bringing into captivity every thought to the obedience of Christ, so that the “real me” prevails when pitted against my false self. I think the last part of that sentence (“…but in the sinful nature a slave to the law of sin”) is one of the most important phrases in Romans. On paper it is hard to communicate what I believe is the proper inflection of the phrase were it read aloud, but I’ll call the inflection very peacefully resigned, sort of like “Hey, what can you expect? It doesn’t surprise me. Yeah, it’s him again. Loser.” Although you will always have the sin nature, if you really grasp the massive truth in verse 25, it won’t have you! Then when the sin in you raises its ugly head and temporarily prevails in you, which it will do at times, you will not respond by thinking that you are a worthless piece of garbage who could never do anything for God. No, you will understand that you are a righteous child of God with a disgusting sin nature that is the cause of ungodly behavior. You will recognize how its strategy beat you this time and learn how to win by making the right choice next time. You will boldly go to your loving heavenly Father for forgiveness, knowing that it is yours for the asking. I will close this column with a short excerpt from a book titled Abba’s Child, by Brennan Manning. In light of what we have been so far on this brief journey, it is most fitting. The “false self” to which Manning refers is another way of describing the sin nature. I will intersperse my commentary in bold type. The false self relies on outside experiences to furnish a personal source of meaning. This impostor is what he does. The impostor is a liar, a false self that stubbornly blinds each of us to the light of the truth of our own emptiness and hollowness. My false self is the one who wants to exist outside the reach of God’s will and His love, outside of reality [aletheia = truth] and outside of life. The sad irony is that the impostor, my false self, cannot experience intimacy in any relationship. His narcissism and self focus exclude others. Incapable of intimacy with self and out of touch with his own feelings, intuitions, and insight, the impostor is insensitive to the moods, the needs, and the dreams of others. It is the nature of the false self to save us from knowing the truth about our real selves, from penetrating the deeper causes of our unhappiness, from seeing ourselves as we really are—vulnerable, afraid, terrified, and unable to let our real selves emerge. If I do not come face to face with the gruesome reality of the sin that dwells in me, I will not recognize my need for the Savior from that sin. Then I will try to save myself. Jesus never tried to save himself, but rather, “…when he was reviled, reviled not again…,” but entrusted himself to Him who judges rightly. On the contrary, I am very quick to defend myself. The false self is an internal defense attorney who is never out of the office playing golf. The impostor argues relentlessly that my equilibrium [comfort zone] should be maintained, even if it means placing unreasonable limits on personal hopes and dreams and accepting life in a diminished form. The false self specializes in treacherous disguise. The false self is the lazy part of me, resisting the effort, the asceticism, and the discipline that intimacy with God requires. While the impostor draws his identity from past achievements and the adulation of others, the true self [the “inner being”] claims identity in its belovedness. Living in awareness of our belovedness is the axis around which the Christian life revolves. When I draw life and meaning from any source other than my belovedness by God, I am spiritually dead. As to the question, ‘Who am I?’, Thomas Merton responded: ‘I am one loved by Christ.’ The indispensable condition for developing and maintaining the awareness of our belovedness is time alone with God. Our identity rests in God’s relentless tenderness for us as revealed in Jesus Christ. Amen. Religion says: “I do, therefore I am,” and the result of such outside-in living is emptiness and disappointment. But genuine Christianity is rooted in the truth that “I am, therefore I do,” that is, inside-out living. The more I know that I am one beloved by God and the Lord Jesus Christ, the less I defend myself; the less I try to control or manipulate others; the more I risk myself to reach for others; the more I seek first to understand; the more I give up my life for others. That is how I want to live—being true to the truth. How about you? See you in a couple months—on the edge.